Today's adults juggle caring for aging parents and children while working full-time. 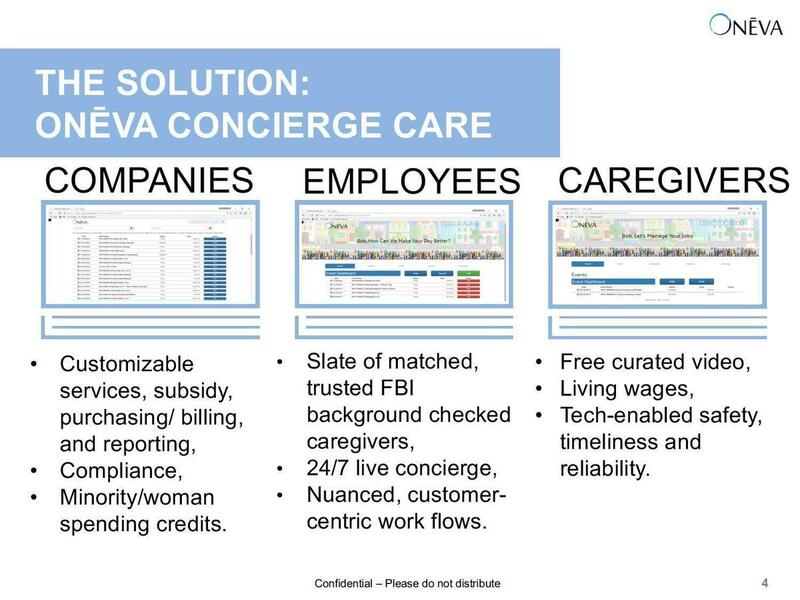 Oneva makes finding trusted in-home care easy with our platform to find, book, and pay high-quality caregivers as an employee benefit. Last year, we finished a year-long pilot at Microsoft. As a result, several other large Fortune 100 companies, plus the Finnish and Japanese governments, showed interest in Oneva. Now that we built our tech, we’re ready to close contracts on companies in our pipeline. 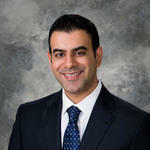 1 Four years in business serving the in-home care market. 2 Completed year-long pilot for Microsoft SF Bay Area employees providing 1,876 hours of care. 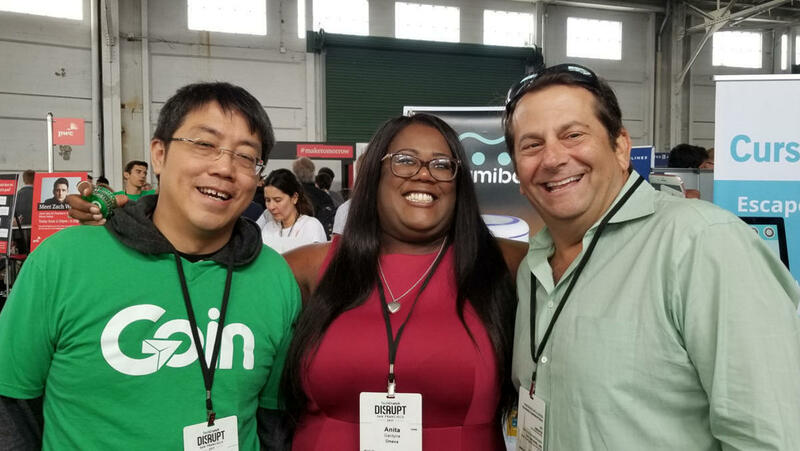 3 Runner-up at TechCrunch Disrupt SF 2017. 4 Winner Best Startup Silicon Valley 2015. 5 CEO is ~11th black woman to raise over $1M in U.S. history and has extensive finance and executive experience at Levi’s, Pacific Bell, IDG, Quantum, and UC Berkeley. 6 CTO has over 30 years of engineering management at 12 Silicon Valley companies, and three exits (including Xros to Nortel for $3.25B in 2000). 7 Oneva has two patents: concierge care platform and personal video commercial studio. 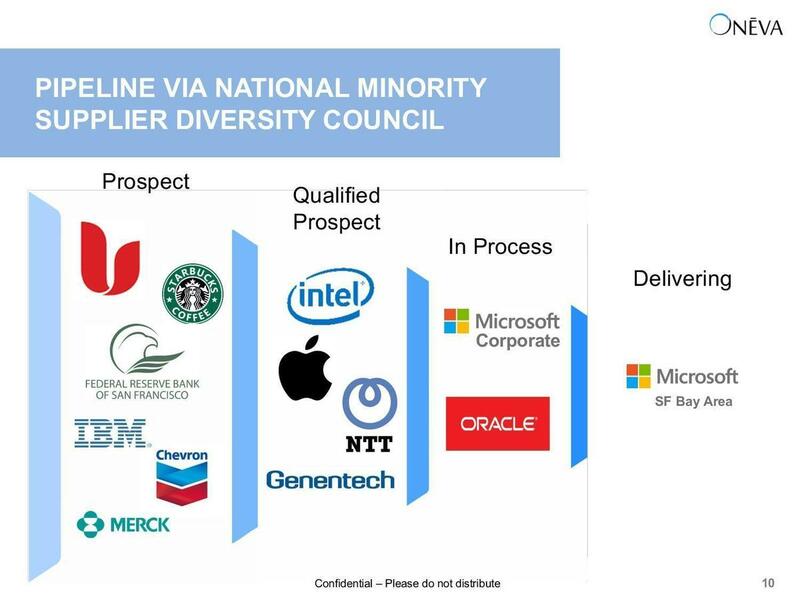 8 Oneva's minority certification and the Technology Industry Group (TIG) have us in direct contact with Oracle, Intel, and other tech firms striving to increase their minority spending. Former CFO, Seagate. MBA. Skilled in technical large-scale systems, finance, and enterprise sales. 32 years engineering experience. Holds 10 patents. Engineering lead at 3 companies with exits. Manages team of two. Manages aspects of network/IT security, hardware, QA, and operations at Oneva. Specialties: C++, Networking, Visual Studio 2008, Visual Studio 2010, SDL DirectX. Establish and maintain relationships with enterprise clients, employees, advisors, and investors. When I met Anita at a conference a few years ago, I knew immediately that she was an unstoppable force of nature. She’s built Oneva from ground zero with all the odds stacked against her, by working harder and with greater determination than just about anyone. She’s opened doors that I never even knew existed, and landed some of the biggest customers and partners in the world. Being a part of Oneva’s success means so much more than just making money (though that’s certainly a source of appeal). It also makes the world better by helping families care for their loved ones, and by making Anita a beacon to inspire other entrepreneurs. 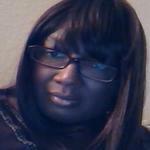 I've worked with and mentored Anita for the past two years. When we met, her passion was evident. She'd formulated an excellent business plan and had a vivid vision of where Oneva was going and how to get there. She's created a platform and business model that should disrupt the concierge care business by providing jobs and living wages to marginalized people while offering highly-skilled and FBI-checked caregivers to families in need. I've seen Anita and Oneva grow together. She's a tireless, dedicated, consummate professional who is also ethical and highly competent. She's well-respected by her peers and competitors. Microsoft and I continue to work with Anita and Oneva as we believe in both the person and the mission of Oneva. 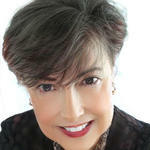 Anita is passionate about providing safe, quality care for children, individuals with special needs and older adults. She is creative and innovative in her approach to creating a service that meets the needs of parents seeking child care and others needing care for the adults in their lives that need support. Early on in the development of Oneva, she learned about California’s TrustLine background check with access to FBI and CA DoJ records, and reached out my network. She understands the critical importance of providing qualified caregivers to care for our most vulnerable citizens while at the same time valuing the work and commitment of the caregivers and the need to pay caregivers a living wage. Look up the words relentless and focused in the dictionary and you'll find Anita Gardyne's picture. Bob Gardyne builds great technology that can be used by millions of people simultaneously. He makes engineering look magical and fun. 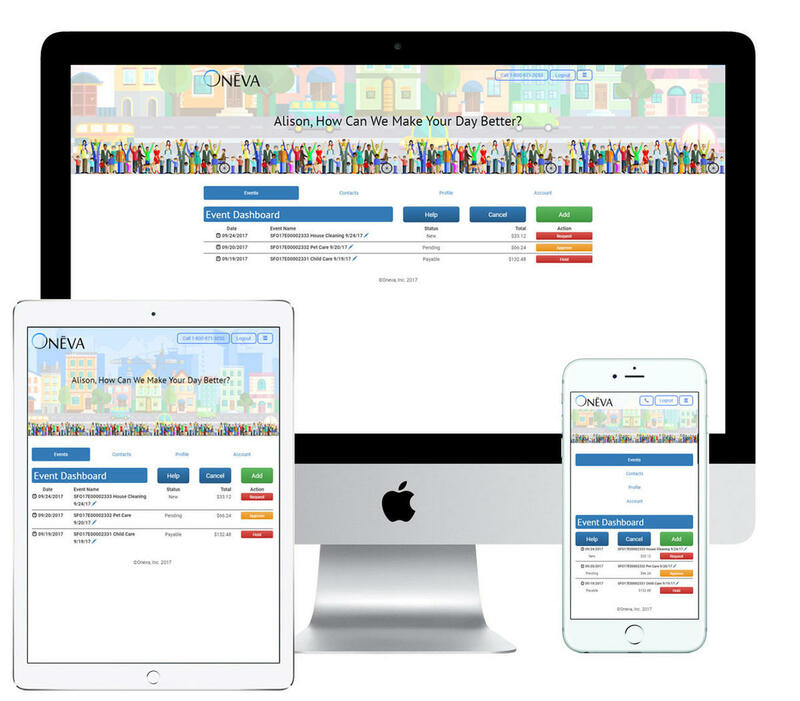 Large Fortune 500 companies engaged in a bruising war for talent will win when Oneva makes it easy for them to offer elder care as a benefit to their employees. This keeps their employees focused and more loyal to the employer that is offering peace of mind for their families. Many adults in today's workforce juggle caring for pets, children, teens, and aging parents – all while working full-time jobs. They can't do it alone, so we built Oneva to help them find trustworthy care providers for the whole family. Oneva providers offer infant, child, adult, elder, and pet care, as well as driving, house cleaning, and overnight stays. And unlike other care companies, all our providers are required to pass FBI background checks. While consumers might seem like the obvious way to sell in-home care services, we can meet the exact same families who need the exact same care through employee benefits at work. 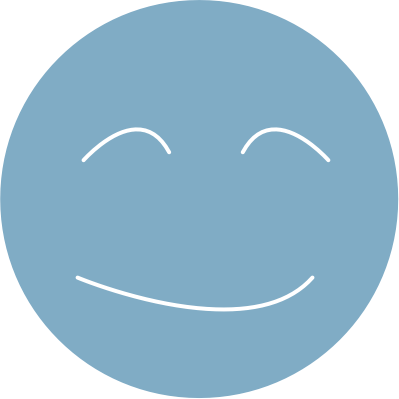 By integrating into their HR, just like health, dental, and 401(k) benefits, we create trust from the start. And by offering flexible payment options through stipends, grants, awards, payroll deduction and FSA reimbursement – which we couldn’t offer in the consumer market – means customers are more likely to keep purchasing care through Oneva. 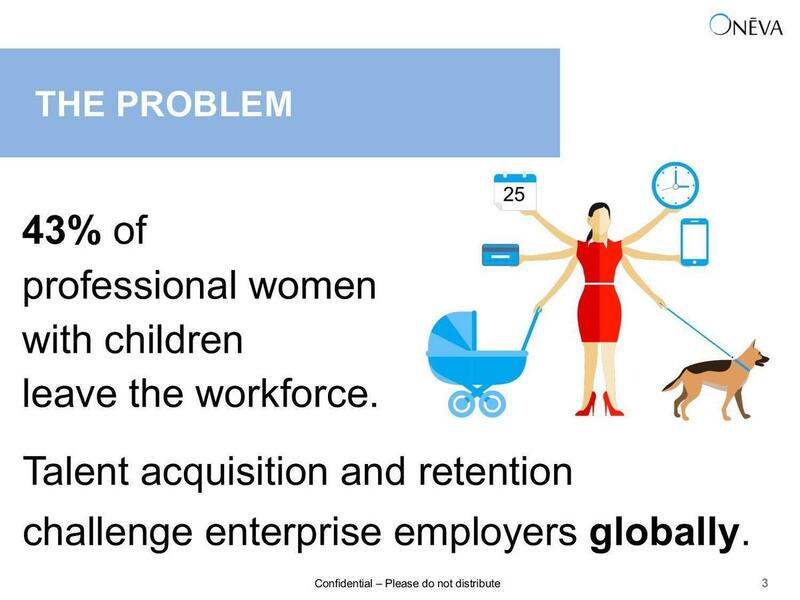 Forty-three percent of women with children leave their careers. After she had her first child, our founder, Anita Darden Gardyne, joined their ranks when she left her job as CFO at Seagate. Oneva started with infant services, but as Anita's family changed and Oneva changed too. When her mom suffered a stroke, Oneva started offering elder care and driving. $50 a day for in-home care through Oneva was enough to keep Anita’s mom in the same home she’d lived in for the last 53 years. Nursing homes ar expensive but keeping your mom in her own home is priceless. With advisors and mentors like Rev. 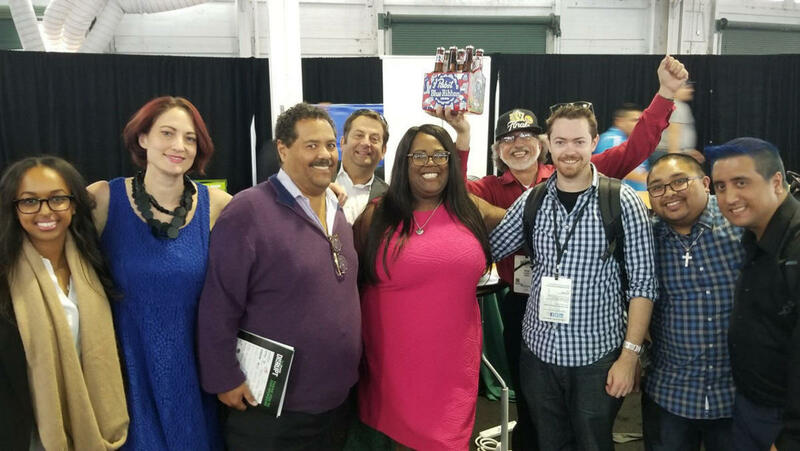 Jesse Jackson and Fred Thiele, GM of Benefits at Microsoft, we won second place at TechCrunch Disrupt and joined the Technology Industry Group as one of their recommended minority-owned businesses. 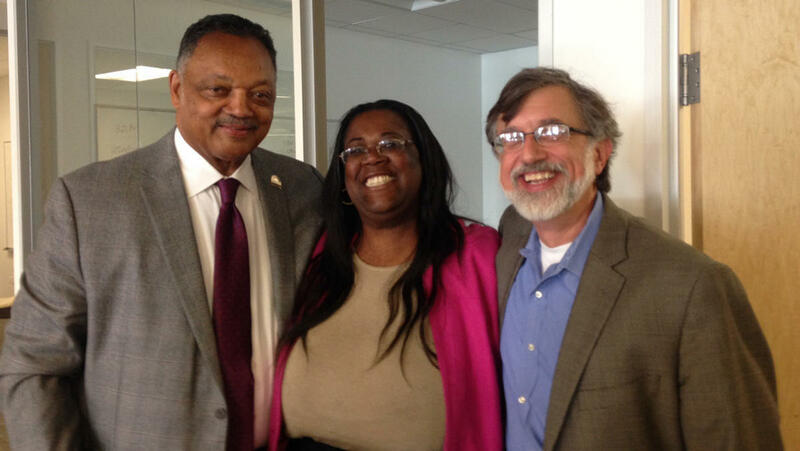 Reverand Jesse Jackson, who helped us set the course towards enterprise customers, with Anita and Bob. Anita with advisors Allan Young (l) and Keith Newman (r). 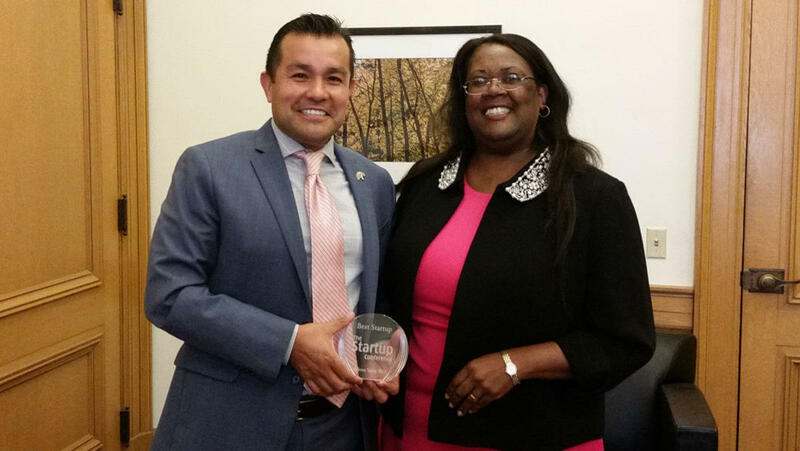 Anita with Oakland's Director of Equity & Strategic Partnerships, Jose Corona. Originally launched in January 2014, our company rebrands to Oneva for broader elder and enterprise appeal. 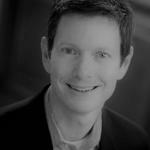 Microsoft’s GM of Benefits Fred Thiele starts mentoring Oneva. Anita pitches and wins best startup from field of 100. SF Bay Area pilot to confirm demand and services, complete platform MVP, and generate collateral and workflow. TIG supports minority-owned businesses to become suppliers for companies like Apple, Google, and Facebook. Benefits sends out one email to Bay Area employees, who access Oneva through Benefits portal. Pilot finishes after unprecedented extension. Oneva submits into Oracle’s Empowerment Program. This accelerator brings pilot-ready startups to enterprises and VCs. Insurance companies show interest in Oneva. Oneva complies with new EU privacy standards taking effect in May 2018. Plan to release caregiver and client native applications to improve service quality and reliability. 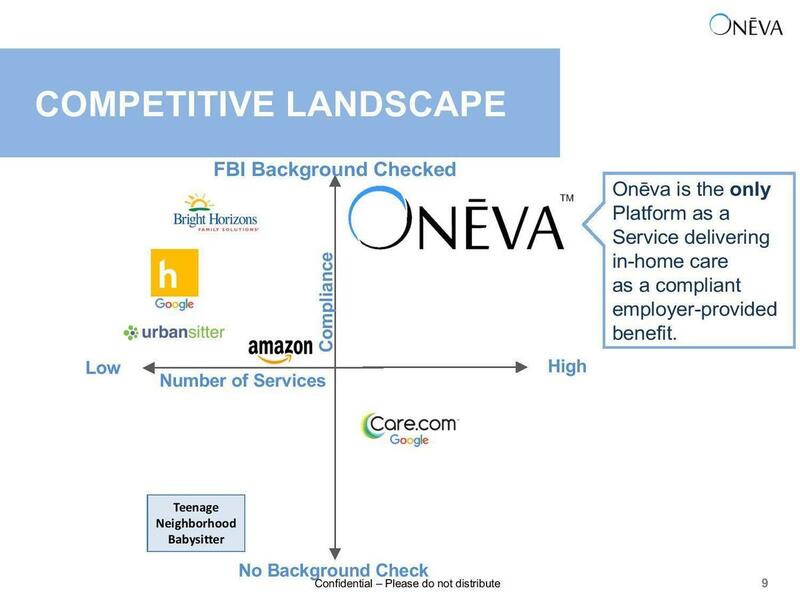 Oneva hopes to secure subsidized enterprise contracts with addressable market of 10,000+ SF Bay Area employees. Even as a five-year-old in 1968, I was aware of Dr. King’s Poor People’s Movement. My parents made sure of that. As a family, we shared Dr. King’s belief that all citizens deserve access to the American Dream, including living wage jobs and a job ladder to allow economic mobility for all who are prepared, able and interested. And I am proof his mission lives and is being fulfilled in building Oneva. So, what is Oneva? And why did Microsoft choose to collaborate with me to provide solutions for elder care on a global scale? 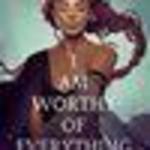 Most importantly, why should you choose to invest in this certified minority female founder, referenced as the 11th Black female founder in US history to raise $1 million? 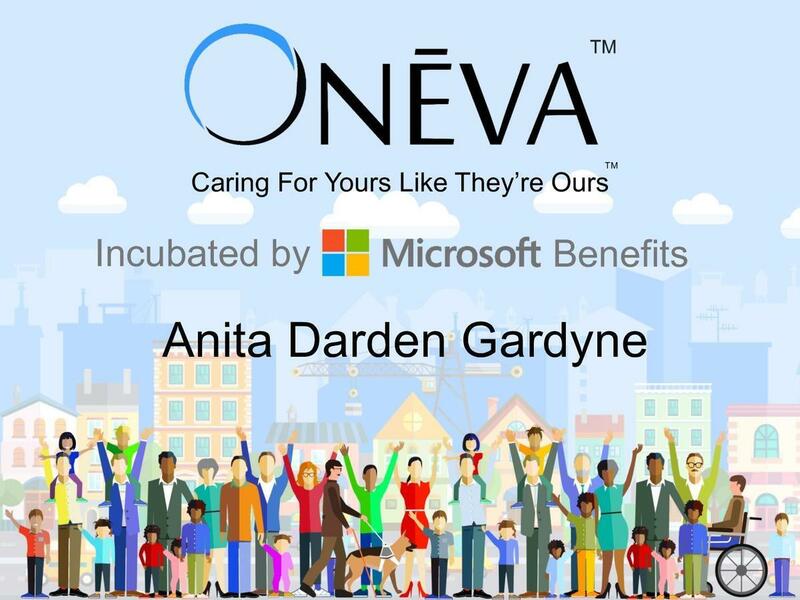 I’ve prepared my entire academic and career life to be CEO of Oneva, deliver care to our most vulnerable, and create hundreds of thousands of great paying jobs right here in America as a way to lift large numbers of people out of poverty. I spent ten years at UC Berkeley earning a BA in Economics and an MBA, then designed large technology platforms at America’s top companies while directly and indirectly leading cross-functional, cross-departmental teams to design and implement new technologies. I also led financial operations of multiple multi-billion dollar operating units as an executive at several renowned companies. Most importantly, my background has taught me the highest values of persistence, authenticity, humility, and kindness. Those are all reasons Fred Thiele, General Manager of Benefits at Microsoft, cited when he told me that I am the right founder to collaborate with him to solve elder care. Some investors invest based on shared values. We see opportunities to change the world with social impact (often called double bottom line investing) because we have the potential to generate thousands, tens of thousands, and even hundreds of thousands of good living wage jobs. We will keep more elders in their homes and will drive children to school and tutors with trusted caregivers, rather than just anonymous, gig-economy drivers, so that our most precious young and old are safe. Our mission will make employers better, families more relaxed, and help bring an underclass to prosperity. Other investors want to invest early in a company that has unicorn potential, to gain wealth from finding the next Facebook or Airbnb. We’ve had numerous major U.S. tech firms and even other countries express interest in Oneva. These potential customers have a market size of tens of millions of employees. 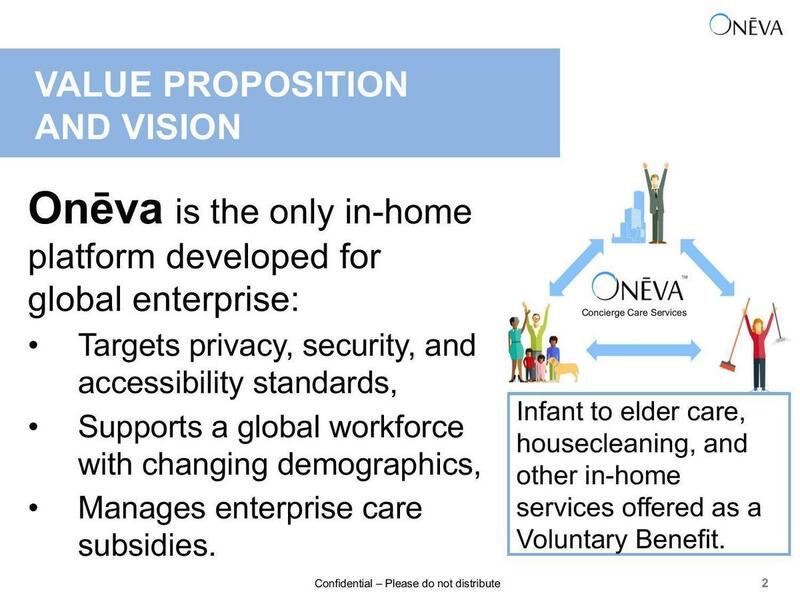 At $500-$1,000 a month of revenue for each Oneva Care user, Oneva has the potential to be a multi-billion dollar business. Regardless of why you choose to invest in Oneva, we appreciate your confidence in our market, team, values, potential, and passion. Thank you for considering an investment in Oneva. 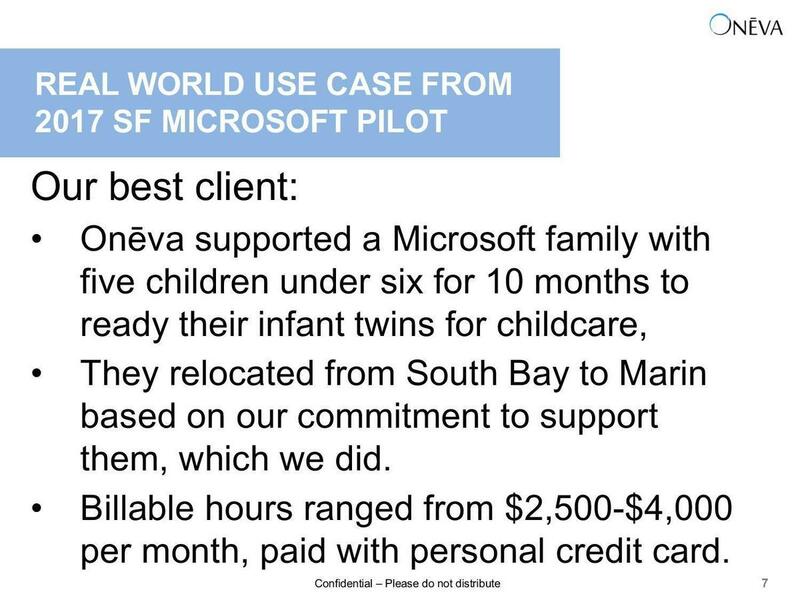 Results from our SF Bay Area pilot at Microsoft. We're bound by nondisclosure agreements, but we have three large companies with 60,000 to 100,000 employees each in our pipeline. Funds raised here will finish the technology build and close those contracts. Beyond that, we've been approached by 25 Fortune 100 companies, including five domestic insurance companies. We want to generate millions of living wage jobs, let elders age in their homes, and let workers stay in the workforce. The demand for in-home care is only going to grow: globally, our population is increasing in size and age. In the U.S. alone, the 65+ population is projected to grow from 48M to 88M by 2050. That's a lot more people who will need care – as the first in-home care company for large organizations, we're well-positioned to turn this opportunity into a massive business. Our mission is to enable everyone to receive trusted care in their home, whether it be for themselves, their child, their parent, or their pet. One hundred percent of our providers pass FBI background checks and have verified credentials: academic history, work history, and recommendations. Uber has a technology platform, and they use it to connect cars and drivers to people who need rides; you don’t know who your driver is and you might worry about that, and they don’t know who is getting in their car, and they definitely worry about that. We have a technology platform, and we know who your caregiver is. We use our platform and our concierges to send out FBI-background-checked and well-verified providers of infant care, elder care, house cleaning, massage, pet services, and caregivers who can drive to take mom or kids to doctor’s appointments, shopping, after-school sports, and tutors. We enable our customers to add the trusted resources they need to successfully balance work and home life. That helps employers, who subsidize these services as a wellness benefit, to attract and retain the best employees. Best of all, we create jobs with living wages that focus on safety and advancement for an aspiring class of our society that only asks for a ladder and a hand, and not a handout. We enrich and create success for four stakeholders: investors, employers, families, and caregivers. In 2003, we couldn’t find trustworthy care for our newborn daughter, so we didn’t go out on a date for three years after she was born. Fast forward ten years, and in 2013 we looked at the online care market again, assuming the problem of trustworthy care for parents had been solved. We checked the disclaimers at the bottom of all the “care” websites to see if anything had changed for the better. It hadn’t. However, by 2013, we both had more than a couple startups under our belt – one of Bob’s companies, Xros, had been acquired by Nortel – and we knew we could fix this ourselves. So, we incorporated, with the help of some pretty smart attorneys at WSGR in January 2014 – these attorneys also helped found companies like LinkedIn, Apple, Tesla and Google. In June 2014, we launched in Montclair Park in Oakland, California, with infant care services, a service range of San Francisco East Bay, and a very hand-operated 1.0 version of the platform. I had a mom spend an hour with me in the park that day, saying how much they needed a service like ours, how valuable it was, and sharing that she would pay around $18 per hour for infant care. That really hit home, and we knew we needed to do this. From that moment on, we made a concerted effort to use our technology to keep the price of care affordable while also providing living wages for caregivers. We realized that to accomplish our goals of client affordability and caregiver living wages, we would need both scale and technology, and we determined the platform features that we needed to scale the consumer market from running infant care services through the end of 2014. We shared our new database-driven Oneva 2.0 platform with the Bay Area in January 2015. You could view, book, approve, and pay for care providers from the platform. We added elder care and driving to our earlier infant care service – we started picking kids up from school to take them to swim lessons so parents could stay at work, and driving mom to Kaiser and back for her medical appointment. We experienced rapid growth in the consumer market in the first half of 2015, and we were proud to win Best Startup Silicon Valley in June 2015 at the Redwood City Fox Theater, beating out over 100 companies from an initial list of 600. We had a number of companies and foreign governments approach us and ask us to make our technology available to them, particularly for elder care, which is a huge global issue. Tarja Halonen from the University of Tampere in Finland came and interviewed us, and she returned in December 2015 to tell us that, in accordance with Finland’s government, we have the best elder care solution in the world. She wanted to know how we could go forward in collaboration. She’s traveled here five or six times since and continues to request our technology. We are extremely interested but not yet ready for international markets. A major Silicon Valley Fortune 50 firm (under a tight NDA) approached us, and strongly encouraged us to build an enterprise-grade version of our platform and secure our minority- and women-owned business certifications. We listened, started enterprise design, and certified as a minority-owned company through the Western Region Supplier Diversity Council (WRMSDC). We are in process of securing our woman-owned certification. Both certifications allow enterprise companies to claim credit for minority and women-owned business spend, targets that they have pledged to meet and have had difficulty in doing so. We will help them. In December 2014, Fred Thiele, General Manager of Benefits at Microsoft, joined our development team as a patron and mentor. With his input and guidance, we honed our enterprise requirements, targeting Oneva 3.0 exclusively for enterprise use, and designed network security and privacy features to meet Microsoft Supplier Data Protection Requirements. We completed Minimum Viable Product for enterprise, including web-application, collateral, training and workflow with the last 3.x release in October 2017, and we continue to add security and privacy features in every coming release. All this history corrected assumptions about how customers use care, who they are, what exactly they need, how to best onboard them, and how much they’ll pay. We made the major pivot to enterprise with all our previous operational experience. We’re now in a position to take the next step with a large-scale enterprise contract. What do you hope Oneva can accomplish? I'm going to just share honestly for me. Unemployment is down, but not equally or as well for everybody. I know that there is a huge opportunity for us to create a massive number of living-wage jobs and really lift a lot of people to a new socio-economic class. I was five years old when Martin Luther King, Jr. died, as he was starting a poor people's movement. Poor people are everywhere. I’ve watched Reverend Jesse Jackson, who has been and continues to work on diversity in Silicon Valley, achieve limited hard-won success, with so much more to do. I am absolutely committed to doing my part in continuing Dr. King's and Reverend Jackson’s work, through which we create job opportunity and pathways into great paying jobs with career ladders. Here is how we do it. We have a job ladder that primarily sources caregivers and service providers as independent contractors who set their own wages and schedules. 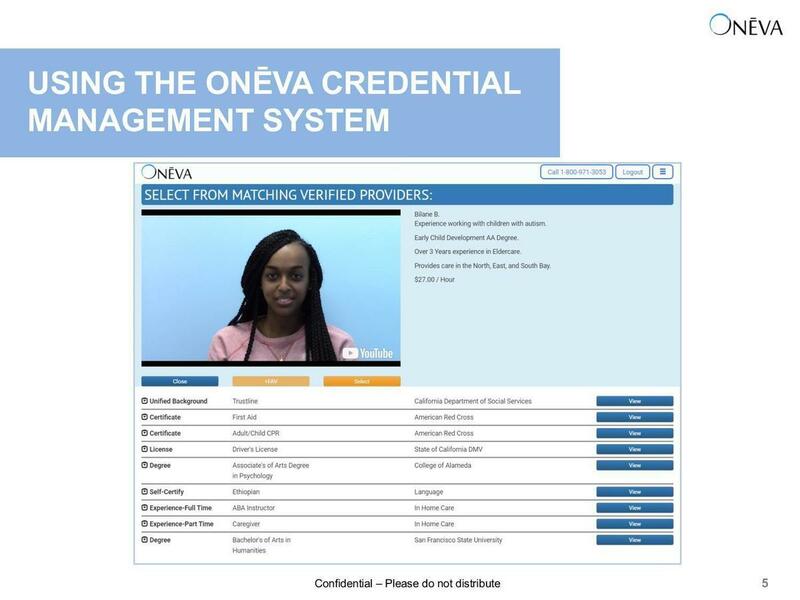 We support every Oneva caregiver with a directed personal marketing video, and we verify their background so everything on the website has been independently checked. We encourage contractors to continue their education and develop work experience so that they can take on more demanding and higher paying jobs. We take the best of our contractor caregivers and bring them in as employee caregivers, where we can provide them with training and additional opportunities, including advancement into client and caregiver onboarding and caregiver supervisory roles, logistics and administrative positions with benefits, as well as technical and managerial roles. However, no matter how far they go, each and every Oneva caregiver and service provider gets to set their own wage above a living wage floor and gets access to high-quality, pre-screened clients in their area so they can be the masters of their own success. There's such a huge opportunity to continue that work on a global scale. Finland and Japan both have serious elder care problems, exacerbated in Finland by the lack of care personnel training between none (personal babysitter) and Registered Nurse. One of the main reasons Finland likes Oneva is the explosive job creation that could come with our platform, helping reduce widespread unemployment by creating caregiver academic curricula and degrees at Finnish universities. As I said before, international has to wait for domestic rollout. What I want to accomplish for our client families is much closer to home. Sadly, my dad passed last September from cancer. In addition to hospice nurses, I had Oneva workers in my dad and mom’s house almost every day. While I had family members coming through saying their goodbyes, our floors were clean, the toilets were clean, my dad was clean. Somebody was doing his laundry. Our hospice nurses said we had the most well cared for and best run home they had ever been in, and that wasn’t because of my personal domestic ability. I was able to take care of my dad the way anyone would want to, and I am now keeping my 83-year-old mom in her home with Oneva caregivers two to three times a week. She would not have made it in a nursing home long, but now six months later, she is bright, vibrant, and healthy sleeping in her own bed under her own roof, with a little added care bridging the gaps. That is what I wish for your family, and that is what drives me. Elders in their own homes and kids safely driven to sports and tutors. Oneva can drive up real labor numbers (like labor force participation), make companies better places to work, and hope to make some money along the way. That is what I want to accomplish, and I hope you’ll join us. We have three customer segments that require independent marketing and sales efforts: enterprise companies, end-users of services who are employees or customers of enterprises, and caregivers and service providers. We’ll start with end-users because they generate actual service demand. Eighty percent of care in the U.S. is selected by women, and we market to these moms and daughters (and dads and sons too!) through the enterprise wellness/benefits channel to attract and retain female employees. We meet the exact same women with the exact same care needs as Sittercity or Care.com, but instead of mom researching comparative sites from home, she gets a reduced care rate and a care company that she can trust from work as a benefit, right alongside her health, dental and 401(k). Most people can go out of network for dental and health for an increased cost, but they don’t. We know that offering care services as an HR benefit with an employer subsidy eliminates client-caregiver cheating (which describes when a family finds a caregiver on a platform, establishes a relationship, and then chooses to move payment off the platform). Oneva focuses on positives to glue everything together: great client service and meeting caregiver needs for safety, support and timely payment. Enterprise companies will choose to offer Oneva as a wellness benefit because it helps them attract and retain all employees in a highly competitive job market. Our target customers are large, often multinational corporations with thousands to hundreds of thousands of employees. As a member of the Technology Industry Group (TIG), we have direct reach to 36 of the top U.S. tech firms committed to using certified minority-owned businesses to be their suppliers. Their corporate members include Apple, Google, Facebook, and Oracle. 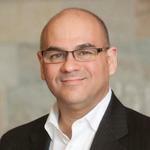 We were introduced and sponsored by Fernando Hernandez of Microsoft’s Supplier Diversity Team in 2016. Some of these TIG firms already spend $1B+ with minority- and women-owned suppliers, and have even higher targets that they’re not meeting today. TIG has already proved valuable: we got an introduction to a Fortune 100 tech company through their network. We expect to source most of our large enterprise customers from TIG. We had a pilot with Microsoft in the San Francisco Bay Area from November 2016 to November 2017, and as a result of that pilot, we finished building the 3.0 enterprise technology platform, and creating all of the necessary printed and video printed collateral, digital signage, client workflows, concierge training, and caregiver sources and onboarding workflow. We finished a second pilot entry program in December with the TIG Fortune 100, one of the Bay Area’s largest tech employers. With that Fortune 100 company’s direction, we created a professionally produced video and electronic brochure that was shown to employees and HR/Benefits in November 2017, and we are engaged with that company’s Supplier Diversity/Procurement department to formally present our product to HR and Benefits executives and directors. Although we don’t yet have a contract, we have engaged with this Fortune 100 company for over two years, and have followed their internal processes perfectly and to the letter. We were recently accepted into Plug And Play (PnP), a pilot-ready accelerator for startups, enterprises, and VCs. It was the first accelerator we’ve found that was a fit. At PnP, we met the CEO and five of his staff of a Fortune 300 workers’ compensation provider that employs thousands directly, and serves 33 million people globally. Last week, their VP of business development came to me and said, “We need to be able to scale to all 33 million people in 12 months from the time you start a pilot program with us. You clearly can’t do that today. Let me introduce you to this other place where they take companies like yours and grow them to regional scales. I just bought a company from them, and I want them to work with you so I can buy you too.” While not a contract or a letter of intent, we have clear indication that our business model and services apply to a much larger set of enterprise channels than just HR/Benefits. The Fortune 50 firm, another TIG member, wants to re-engage with us in July. Customers are billed by the hour for the services they request. Each contractor is free to set their own rates, and we mark up those rates to an end-user price based on a volume/margin agreement with enterprise. For example, Microsoft employees paid a markup of 44% in the 2016-17 pilot, giving us a 30% margin after COGS. Oneva makes money directly from enterprise customers with a one-time platform setup charge, report fees, and service fees. We also generate recurring regional support fees and annual maintenance.Customers pay for services using a flexible funding model. They can use personal credit or debit cards, as well as employer sponsorship, subsidies, or awards. They can use their FSA for Dependent Care so they can get an easy, properly documented PDF to submit for reimbursement. Employers can also contribute to monthly stipend pools, flat or discounted care rates, performance awards, and one-time grants for employees to use. How much do you pay the workers your customers connect with? Most service providers and caregivers are contractors who set their own wages above a living wage floor of $15/hour. Caregivers can charge different rates for each of their offered services so that a client can pay a single caregiver an equitable rate for each service. Most caregivers price their services between $15/hour and $25/hour, with driving and massage notable exceptions. We suggest a tip of 15% for excellent service based on the client price. The client can set a default tip so caregivers know what to expect, and a client can adjust tips individually at the end of a job for multiple caregivers. The client price is set by multiplying the caregiver wage by our markup, negotiated with each enterprise. For example, a contractor who sets her wage at $15/hour would be priced to a Microsoft pilot client at $15/hour * 144% = $21.60/hour. The 15% suggested tip, which goes 100% to the caregiver, gives the caregiver another $3.25/hour, for total compensation of $18.25/hour. The client pays $24.85/hour and Oneva makes $6.60/hour margin. The workers earn about $18 per hour. We consider $15 an hour a living wage here in the Bay Area, so we start with that living wage. Depending upon the contract we have with a given company, how much employees pay versus how much their employer contributes may vary, but in the end, it’s about $25 an hour. Beyond that, most folks tip for great service, and that gets our workers over $18 an hour. In the Bay Area market, that's the price. It's going to differ in other markets. What services does Oneva offer? We strive to offer a cohesive set of services that help busy families balance work and personal lives, and help elders stay in their homes or with their families. We started with infant and child, then added elder care, disabled care and driving to meet the basic needs of our clients. In our 2016 pilot, we discovered that our client’s care needs included cleaning their homes and possessions, and that so many clients wanted housecleaning that we developed it as an independent segment with its own workflow and hiring process. Based on client requests, we added pet care and massage. Today, we offer infant care, child care, adult care, elder care, disabled care, overnight care, pet care, driving, housecleaning, and massage. Tomorrow, we can offer any service, but since our platform was built around developing trust through verification, its best used for products and services where trust is important. Our platform has been designed to add services easily as needed. We have to do our legwork and homework first, and then the platform part is easy. Every new service requires work to determine provider sourcing, locate regional and national competition (to partner or poach), and identify restrictions and specific requirements for local, state and federal licensing. All this gets incorporated into our Credential Management System, so we can apply the correct workflow to verify workers properly for that new service for each region where that service is available. Google and Amazon. Amazon Home is new and primarily offers ordering more product from Amazon and ordering services in conjunction with Amazon product install. Amazon can never be discounted or dismissed, and Alexa has been recently rumored to be targeted for an in-home physician application. In the portfolio of companies that Google operates in the care space, Care.com is the closest to what we do. Honor is the second. Both are Google companies. 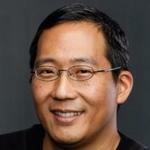 Care.com IPOed and raised $1 billion, and for the first time ever, Google Ventures invested about $50 million post-IPO. They did so because of Care.com's poor financial performance and because it fits within the Google family of products in the care space. Honor was founded by an ex-Google employee, he’d sold his company to Google, and he was a serial founder. Andreessen Horowitz, Kapor and others invested in him first, and then Google followed. There's a company called Thumbtack that does odd jobs, which if you squint overlaps with some housecleaning. Thumbtack is not otherwise interesting except that Google owns it. How is Oneva different from its competitors? The first big difference between Oneva and Care.com is we know the identity of everybody on our site. So if you see my video on my profile on Oneva and I say, “I'm Anita,” you’ll know that’s true because I've presented a driver's license and I’ve been through a fingerprint-based FBI and State of California (all county) Department of Justice background check. And I have First Aid and CPR, and its been checked too. And I really got my MBA at Cal and worked at Pacific Bell and Levi’s - that’s verified too. On the other other hand, I could put a video on Care.com's website and say “I'm Beyonce, and I have 12 years of care experience, and let me come take care of your mother”, but I wouldn’t have to prove that. You wouldn’t know if anything you read was true or not. And you might not know that the State of California says that customers aren’t supposed to pay for caregiver background checks because it’s the caregiver’s responsibility, so you pay for what turns out to be a credit check or even the top ten most wanted list for the county you are in. Secondly, we have a technology platform where you can see a curated video and see all the credentials of the worker in one place. At Care.com, it's like Craigslist. Here's a list of the caregivers, and you have to go call each one. You'll get a list of names, and you might see a video that they made on their iPhone at home. You have to call and ask, “Hey, do you have first aid training? Do you have CPR certification?” Do you even know what are the right questions to ask of somebody who’s going to come into your home, for them to be compliant with the law? You hope it's true, but we actually know the applicable laws and have checked all the required and supplied credentials. Our technology platform presents FBI-background-checked choices, only presenting you with qualified verified caregivers or service providers who are willing to travel to your location at the date and time you need them. More than a simple match, we consider languages, allergies, pet issues, and other secondary factors that can make a big difference in having a successful event for both the client and service provider. We also use technology to make improve the reliability and timeliness of both contractors and employees, because after trust has been established, the next most critical requirements for caregivers is on-time availability Finally, Care.com is enterprise-facing and consumer-facing, whereas we are exclusively enterprise. Care.com is spending huge on consumer marketing with billboards, radio and TV ads. We focus on enterprise with relationship-based sales. California law requires that in-home care providers must be background-checked, and in California, Trustline regulates this. Cindy Mall, the state employee who oversees Trustline, helped me write my business plan. Bluntly, Care.com chose to ignore the 1987 California law regulating care when it built its business. Care.com is in the matching business. It matches providers and customers, but asks them to get background checks themselves. Oneva is regulated by the CA Department of Social Services because we are in the care business. We ensure that our providers comply with the law. As far as scaling goes, Trustline is, de facto, a national standard. If you accept grant dollars to provide childcare, your workers have to meet that Trustline standard. So we really have designed to what is de facto national law, and de jure California law. If you were to look at Trustline, you would see those eighty specific laws it's looking for, it's elder abuse, child abuse, check fraud, and know that this kind of check would have to be mandatory for anybody coming in your home to do anything. Although it seems obvious to us as a requirement of California law that all people caregivers need Trustline, we take it a step further. Every Oneva service provider has Trustline, including housecleaners, pet caregivers, and massage therapists, none of whom are not required by law or regulation to have Trustline. We could not make an assumption that a housecleaner, previously convicted of any of those eighty abuse laws, would be someone we could trust in my home around my kids, husband, parents, pets, or even possessions. And if they’re not good enough for my family, they’re not good enough for any of our clients’ families. Or you. How do you plan to grow over the next year? Our focus has been to build the technology platform so that we can now scale regionally and rapidly. That has been a conscious focus, to get the technology built, because we're first in market. We're the only ones in the world who have an enterprise-grade technology platform. We know because we just won second in the world at TechCrunch Disrupt Battlefield in September 2017, and we have some other technology that we are building – an AI robot video director – so the folks who invest in Oneva also benefit from that second product as it is developed. Now that we have that, absolutely, how do we go after those customers? Our platform is designed for companies with 10,000 to 100,000 employees. We are using the funds raised from Wefunder to finish network security and privacy upgrades in the July timeframe, and close those contracts for the three companies we have in the pipeline. My focus is on getting to the technology completion aligned with enterprise contract signing in July so I can onboard up to four new enterprise pilots or contracts in the San Francisco Bay Area, with end-user ramp-up starting in October. After the San Francisco Bay Area region is well established, we can use well-understood techniques for bringing up new regions quickly, initially supporting additional domestic campuses of our Bay Area pilot enterprises. Credential management requirements and living wage floors will need to be adjusted and normalized for each new region, and the platform makes regional expansion straightforward once the legwork is done. We expect to cover the top seven technical and metropolitan domestic cities within 2-3 years of our San Francisco region relaunch. After that, regional growth and new regions are driven by enterprise demand. On that note, I've been approached by approximately 25 Fortune 100 companies, including five domestic insurance companies. We've recently joined an incubator for pilot-ready startups called Plug and Play, and our demo day is June 13. But independently of that, through the certified minority channel that I've talked about, the Technology Industry Group, and now through Plug and Play, I have almost too many companies and countries asking me if they can invest in me and if I will do business with them. I have more deal flow than I can respond to, and yet none of them are likely to be the first pilot in San Francisco or the second contract in 2018. However, long sales cycles dictate that even if initial contact today doesn’t turn into 2018 business, it will take this contact and eleven more like it over two plus years to turn that initial contact into a successfully onboarded enterprise company. So, while we are selective today about engagement due to time constraints, we are talking to many companies today about business that won’t come to fruition until 2019 or 2020. After we have established a string regional footprint in the USA, we clearly have international interest to pursue, especially in Finland and Japan. We can actually to make a material contribution resolving both elder care and youth unemployment in Finland, and we can create enough jobs in the United States to make the needle move on labor force participation. We want to be big enough to elevate people on national levels. We've raised just over $1.5 million. According to TechCrunch, I was the 11th black female in U.S. history to raise a million dollars. I think there's 27 of us now. I've raised funds for my business in a very rare and unique way, almost exclusively friends and family, and in largely in $5,000 to $10,000 increments. 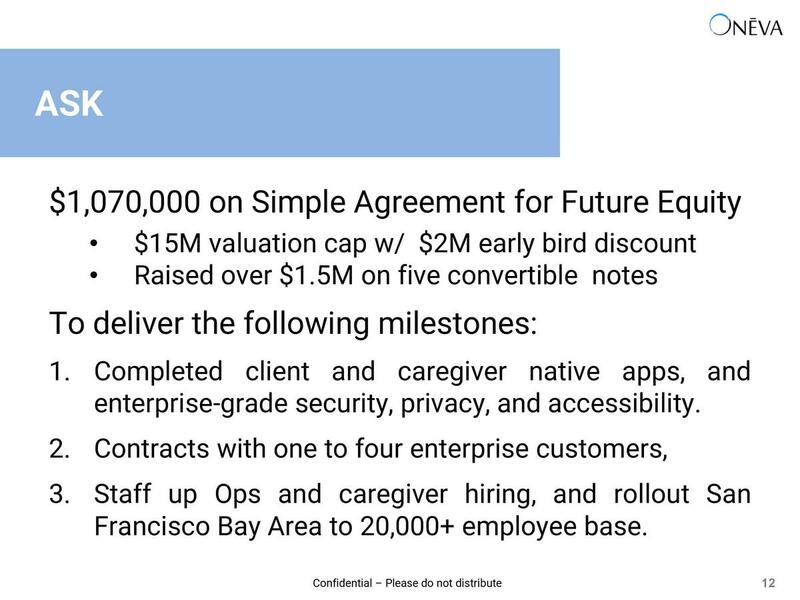 We’ve raised our funds to date in a series of five convertible notes, with the last note having a valuation cap of $12,000,000. When we started with our first note, we had no backend in our platform and all care operations was done manually. We’ve used each note to build technology, run the care business with that technology, and plan the right move to go to the next level. 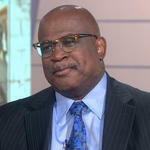 Elder care is a global problem and opportunity, so I am not worried about whether or not my business is needed. I worry about lots of things: funding, quality of execution, network security and breaches, finding the right people to ramo explosive growth. I worry about separating the real short term opportunities from tire-kickers who ask a lot of questions but don’t plan to engage. What really keeps me up at night is, how do I respond to all that demand? And my biggest fear i – what do I do when it all comes? You’ve been in tech for a long time. What networks have been valuable to you? I've been selling into the Technology Industry Group, made up of the 30 largest tech companies, since 2015. Back in 2014, I called Reverend Jesse Jackson and left a message on his answering machine. Three months later, I got a call back from a gentleman by the name of Butch Wayne. Reverend Jackson had a meeting in San Francisco with about 30 black people involved, and there were a couple entrepreneurs in the room, and Bob and I were among them. He talked about how we were going to change Silicon Valley and he was going to help with that. The task that he set before me and Bob was to build a pipeline of workers from Richmond to Silicon Valley, which is what we aim to do with Oneva. 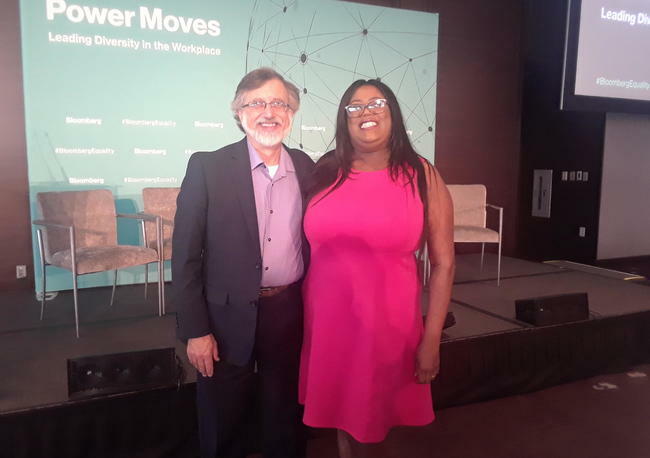 In December 2014, Reverend Jackson introduced us to George Zinn, the treasurer at Microsoft, and Gwen Houston, their general manager of diversity, who has since retired. He introduced us to Brian Krzanich (BK) CEO of Intel and his direct reports. He also introduced us to all of Meg Whitman's direct reports at HP. It's a direct result of those introductions that George Zinn at Microsoft, literally, within a week, had me meet with with Fred Thiele, their General Manager of Benefits. Fred was a Senior Director then, he's been promoted a couple times since, and he's been working with us to build our technology. I like to think we've helped him grow a little as he's helped us build a lot. But I want to acknowledge that Reverend Jackson's introduction, and the commitments of these companies who want to create change, is when we really started that sales cycle. 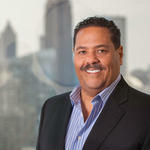 It was Microsoft, Fred Thiele, who engaged Fernando Hernandez and his supplier diversity team on back-to-back certification. They actually have took me into the Technology Industry Group in 2016 and helped me start to sell. Those contacts helped me meet executives at the companies I’ve pitched since, who will hopefully become my clients this summer. In very practical terms, we did a lot of our friends and family fundraising on our convertible notes from our LinkedIn connections established through our professional careers. 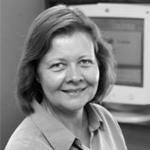 I’m Anita Gardyne, CEO and co-founder of Oneva. My co-founder is my husband of 31 years, Bob Gardyne. He and I met in 1983. We were both students at UC Berkeley, and we were both working in Bank of America's telecommunications and engineering department. He and I have continued to work in technology, together and apart, for the past 31 years. Bob received his Electrical Engineering/Computer Science degree from Berkeley in 1984. You can imagine that Silicon Valley in 1984, as a brand new EE/CS graduate, was an amazing place to be. He had an awesome career, mainly in PC graphics and audio, and was involved in three acquisitions: one of his companies was acquired by LSI Logic, the second was acquired by Broadcom, and the third was Xros acquired by Nortel for $3.25 billion. When Xros was acquired, I was a CFO of a division of what's now Seagate, and it was a $3.5 billion company. That's when I quit my job. I quit my job because we had an eight-year-old son and had to choose between work and family. If I had Oneva as an employer-provided benefit, with someone to help me care for my child, maybe I would've stayed. Today, however, Bob is my co-founder. 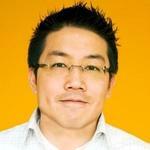 He’s the CTO of Oneva, and Head of Product. I'm very proud of our engineering team, Will Carpenter and Ron Colombo, who've been with us since we started. Will graduated from DeVry and worked with Bob as a test engineer at Jupiter Systems, a video wall company - now, he’s my engineering and test manager, IT guy, security engineer, Adobe nerd, and chief bottle washer. Ron is a programmer through and through. He has a game design background, coded some native apps, and does excellent unit testing so his stuff just works - he’s been keeping us at the forefront of coding technology while Bob does the architectural work and Will breaks that down into stories for Ron to code. As a team of four, we've been together through thick and thin, since the beginning. We recently added Bilaine Beyenne, who started with us as a caregiver, showed aptitude, got her B.A. 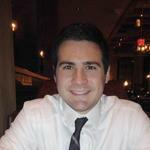 degree, and was hired as an employee last July to support Operations and caregiver recruiting. Bob and I both have experience running large teams, and Bob has run an engineering department with as many as 34 engineers. Anita and I believe in bringing in good people, setting goals, and delegating, and have the hiring and management experience to ramp Oneva staff up quickly. Our cash in hand is $5,000, as of May 2018. Over the three months prior, revenues averaged $1,000/month, cost of goods sold has averaged $700/month, and operational expenses have averaged $50,000/month. Today's adults juggle caring for their aging parents and children while working full-time jobs. Oneva makes finding trusted home care for the whole family easy with our platform to find, book, and pay high-quality caregivers. We're built for large corporations to use as an employee benefit because attracting and retaining top talent means taking care of the whole family. In 2017, we finished two pilots (one at Microsoft), and have LOIs at others, which add up to our annual revenue. We imagine a world where care providers earn a living wage and workers can stay in the workforce, knowing their children and aging parents are getting the best care available. The demand for in-home care is only going to grow: globally, our population is increasing in size and age. In the U.S. alone, the 65 and older population is projected to nearly double by 2050, growing from 48M to 88M. This aging population will put a huge strain on working adults, and Oneva will be there for them. Oneva, Inc. was incorporated in the State of Delaware in February 2014. Winner Best Start-up Silicon Valley 2015. Runner-up at TechCrunch Disrupt SF 207. 30% gross margins in year-long Microsoft pilot. CEO is 11th black woman to raise $1M in U.S. history. 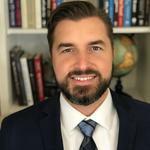 CTO has 7 patents, all supporting video that Oneva relies on. Was an executive at 3 companies with exits. Revenues & Gross Margin. For the period ended December 31, 2017, the Company had revenues of $57,007.48 compared to the year ended December 31, 2016, when the Company had revenues of $44,148.70. Our gross margin was 100.0% in fiscal year 2017, compared to 100.0% in 2016. Assets. As of December 31, 2017, the Company had total assets of $642,320.00, including $0 in cash. As of December 31, 2016, the Company had $378,600.00 in total assets, including $0 in cash. Net Loss. The Company has had net losses of $449,193.93 and net losses of $202,154.64 for the fiscal years ended December 31, 2017 and December 31, 2016, respectively. Liabilities. The Company's liabilities totaled $1,474,415.76 for the fiscal year ended December 31, 2017 and $732,800.00 for the fiscal year ended December 31, 2016. To-date, the company has been financed with $1,519,500 in convertibles. After the conclusion of this Offering, should we hit our minimum funding target, our projected runway is 6 months before we need to raise further capital. We are actively engaged in discussions with over investors to cover our operating costs during this time. Oneva, Inc. cash in hand is $5,000, as of May 2018. Over the last three months, revenues have averaged $1,000/month, cost of goods sold has averaged $700/month, and operational expenses have averaged $50,000/month, for an average burn rate of $49,700 per month. Our intent is to be profitable in 9 months. Our revenue has followed a non-linear path starting with our initial enterprise pilot with Microsoft in the San Francisco Bay Area from November 2016 to November 2017. During that time we developed workflow, collateral, manuals and training, and brought the application to be able to efficiently manage jobs at scale - we ran a consistent loyal customer set with $6-$8K a month revenue for most of the pilot. We ended our pilot with Microsoft in June, and reduced operations and re-coded for security and GDPR. We've retained a few customers but operations and expenses have largely slowed down. Our expected pilot with another client is expected to be larger. While we cannot guarantee it, we expect our enterprise pilot to generate over $250,000 a month revenue on a initial client base of 500+ (out of an employer base of 10,000) within 3 months of pilot start. If we secure our next pilot program, we also expect our expenses to increase as we increase our headcount and make a few key hires. We have additional forms of capital available in further convertible notes in the business. Should this offering not be met we will rely on those to continue financing the business. Our contacts are especially interested in investing more if we get our pilot off the ground with this raise. If an enterprise contract is not awarded or is awarded with an implementation schedule that doesn't generate significant revenue and income within a year of this funding we will not generate the revenue we expect to and company operations could be jeopardized. We collect and store client data, including personally identifiable information of our customers and employees, in our data centers and on our networks. While we have never experienced a network security breach, should one happen our client data may be exposed, harming our business operations and potentially causing cancelation of enterprise contract(s) or even fines. If contractor caregivers are re-classified as employees by state government agencies, that will lead to increases in COGS in the form of payroll taxes and worker's comp. Increased COGS would drive up client prices likely 16-45%, which could significantly and adversely impact adoption, retention and revenue. A network security breach at Oneva or supplier exposes European citizen's personal data, and a poor response results in a violation of the EU's Protection Data Requirements. Violations of GDPR can result in fines up to 4% of revenue if enforceable, and could have adverse impact on enterprise contracts. Current extensive enterprise relationships are extremely dependent on the CEO's extensive networking, and the technology and architecture are extremely dependent on the CTO/Head of Product. Protracted illness or loss of either CEO or CTO before Sales and Engineering Management roles are filled under them would cripple Oneva. Google owns near-market competitors Care.com, Honor, and ThumbTack. Google has the resources to fund the massive pivot to business model that it would take to move Care.com to a competitive enterprise posture. Google could also rebrand or pivot Honor or Thumbtack to be more competitive, which may hurt our growth and revenues. High levels of overall market employment tend to drive up caregiver wages, as it decreases caregiver supply. Lack of nearby available caregivers could drive up transit time, and decrease caregiver reliability and client satisfaction, and ultimately hurt the company's growth and revenues. This note has matured and is in the process of being extended further. 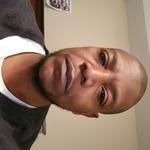 Professional horticulturist, has been working in the Green industry for over twenty-two years. A gardening lover reaching out to those who want to learn more about gardening the organic way. It is my pleasure to express my support for Anita and Bob Gardyne. They are energetic, hardworking, talented, vivacious, intelligent people. They are destined to be successful because they are both technologically competent yet they have a compassion for humanity and a passion for service to their clients. Anita and Bob are like a fire and ice. Anita’s fierce passion and no nonsense approach keeps the trains running on time. Bob is cool as a cucumber giving every time the confidence necessary to know he always delivers on time with the highest quality available. We love Anita and Bob because they say what they mean and mean what they say. We are thankful for the opportunity to work with them. 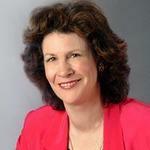 I’ve known Anita since she was my Business Manager and CFO in the ‘90s. I continue to marvel at how she manages to bring her A-game to work every day. Her business acumen, enthusiasm, and quality of character has led her to build and grow Oneva. 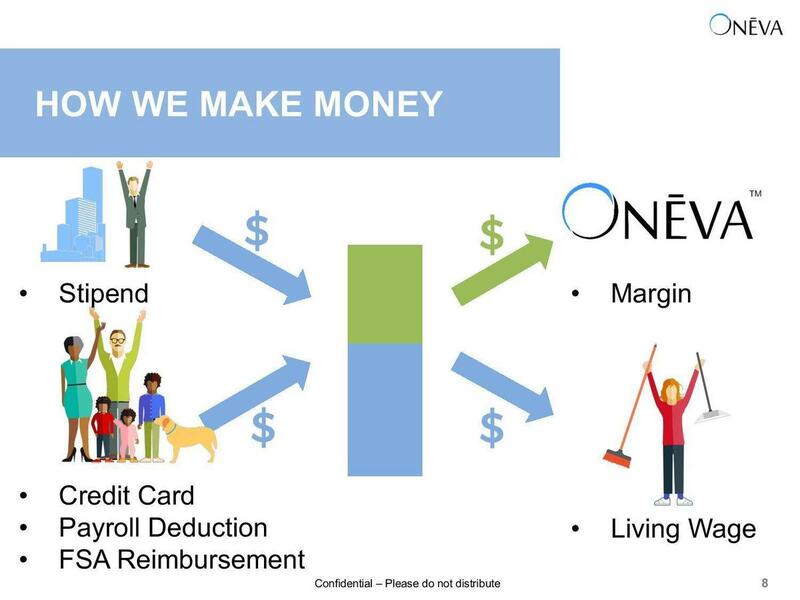 Oneva is a platform that allows businesses to offer business customers unique benefit services to its employees (i.e. elder and childcare, pet care, etc.). Yet her vision isn’t as much about business benefits – it's about life benefits. She's looking to bring life benefits to all partner’s in Oneva’s three-sided marketplace (employer, employee, and services provider). For Anita, Oneva is about improving quality of life. That’s the game she’s changing, and I'm happy to be along for the ride. I joined Oneva as Advisor and active investor at Anita's invitation, who I've known for 30+ years. With more than a decade of marketing and strategic operations experience at Fortune 500 companies, Anita is an accomplished professional. Her husband, Bob, is the CTO and technical visionary behind this unique enterprise platform. This rather unique union has worked extremely well for Oneva to gain a successful market niche. 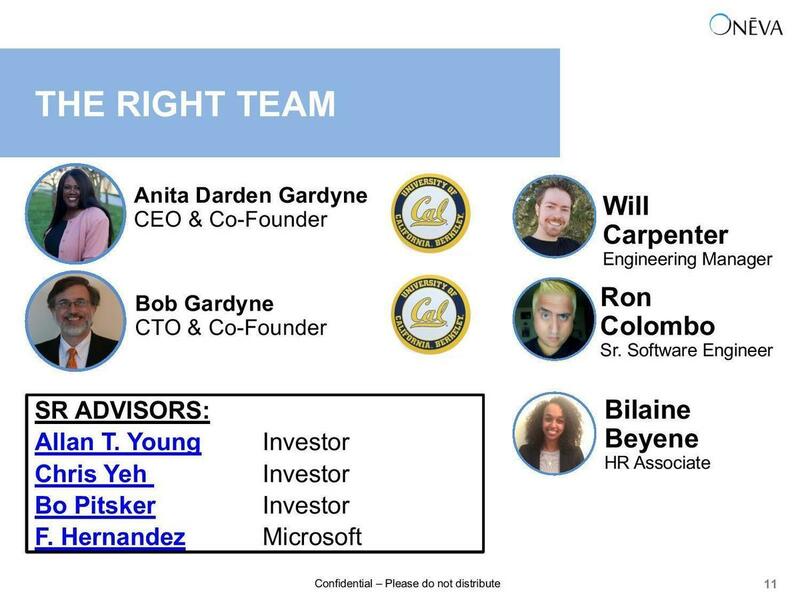 Add to that a wonderful team of technical and management personnel (and advisors), coupled with the visionary enterprise concierge care model that is rapidly evolving and attracting significant interest from leading Fortune 500 corporations, and you have a most interesting investment opportunity. 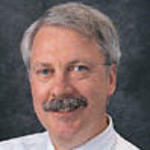 Thomas W. McCullough, J.D., Ph.D. I've watched my sister Anita grow from her time as an undergrad at Berkeley, through her years at Haas earning her MBA, as an executive in Fortune 500 companies, to a superb CEO. She's tough and has a great instinct for business. She's always several steps ahead of all of us, not just in running Oneva day-to-day but in forecasting when and how Oneva will evolve into the giant it'll become. It's amazing to watch her manage Oneva. She is never caught off-guard and she's always calm under fire or when confronted with the day's issues. My family and I have invested in Anita and Oneva, and I am an active advisor because I trust and believe in them. You can trust and believe in Anita and Oneva too. Watch out, America. Get out of Anita Gardyne's way, because she will prevail with her leadership, expertise and, most importantly, her business savvy, authenticity and kindness to bring the Village to you. Anita and her team recognize the importance of the trusted Village to help enterprises retain their valued employees, and to contribute to lifting the economic well being of talented caregivers nationwide. It is not hyperbole to say that Anita Darden Gardyne is a force of nature who can manifest what others deem impossible, through her true grit, determination, intelligence and commitment to making a difference. It is for these reasons I am both an advisor and an investor in Oneva. Bob and Anita both have proven track records in business, which is a no-brainer with any organization you’re going to invest in. But more than that, they have perseverance, dedication, and heart. They see a need that they experienced themselves — the pain of not having someone they could trust to care for their daughter and Anita’s mother. As with most great ventures, by solving this problem close to home, they found a niche to meet the needs of today’s busy professionals. And by going to enterprises, they can hire and help so many more people. You can trust Oneva to take care of your kids, to pick up your package, to take care of your mother — whatever it is, they’ve got your back. I really trust them both. When I finally met Anita and Bob, it was easy to see Anita’s intensity and passion. Bob took me on a whirlwind tour of the technology with pauses for engineering anecdotes and shared experiences. Of course, being a security guy, I asked lots of questions; they were forthright about what they had and hadn’t done. I was satisfied, and invested. I foolishly volunteered to help with meeting Microsoft’s security and privacy requirements so we could enter a pilot program with Microsoft. Anita and Bob didn’t hesitate to take me up on the offer – the rest is history. Anita and Bob have a vision: they sell TRUST, with a service model wrapped around it. In turn, trust requires integrity, and they have it. I'm excited to see what comes next! The fact that it’s being brought about by a woman, and a minority woman at that is pretty cool. ... There’s a need for it in the market. Whether you’re at the young end and need child care or at the other end looking at elder care or find yourself in that sandwich generation where you need both, the need is high. Rashida was great, service was great! Love how you guys keep me updated when the caregiver is on the way. I will definitely be signing up for house cleanings on a regular basis, and would love to have Rashida back again. Thanks! Penninah was great--she was warm, professional and detail-oriented. She took great care of Zach and straightened up the house after he went to sleep. It was such a treat to come home to a clean house. We'd love to work with her again. Hey Anita, i watched your tech crunch video. I really like the platform and your confidence. 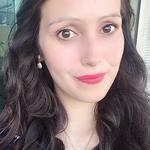 Im a software engineer and i can help anytime with the testing the platform or any technical suggestions/advice or anything. Definitely a growing market for this... Best wishes! 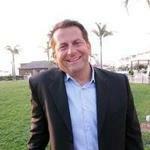 We are a group of SoCal investors and we are very intrigued by you and your company's early success. We look forward to meeting you at some point and participating in the future success of Oneva. Hi Anita and Robert. I believe in what you're doing and happy to invest and make any introductions that may be fruitful on the East Coast. 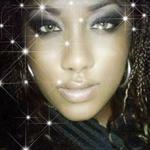 Hi Robert I am Rashmi aka Chittaranjan....Dual names but not bipolar!!!! By profession, I am semi busy architect builder, a Rice U post graduate. This is my 1st investment like this....The industry and qualifications of both of you induced me to invest....I hope this turns out to be super lucrative for all of us. Go for it full throttle!!! Hello Anita and Robert, I have just chosen your company for my first angel investment. I lived 18 years in Oakland before moving to Chicago 2 years ago. I am seeking social/impact investments in companies led by women of color with solid backgrounds and sound fundamentals. 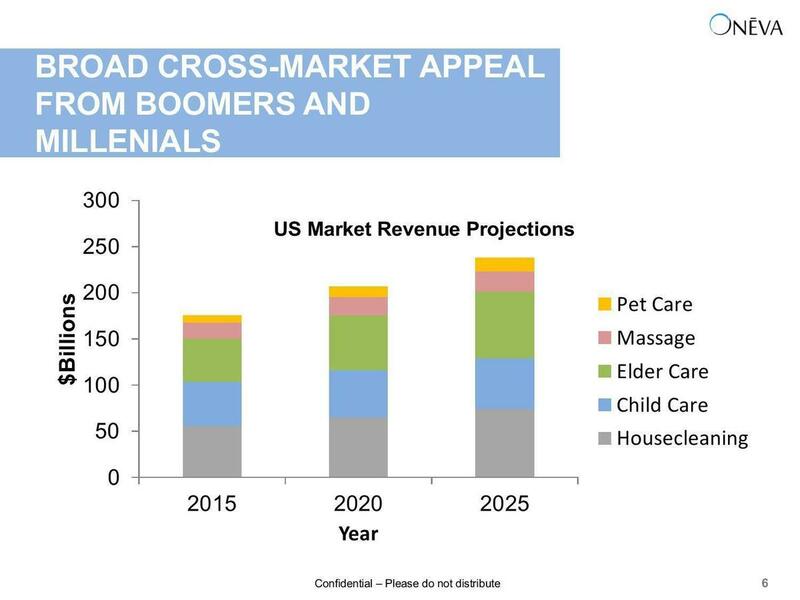 I have a special interest in the aging and eldercare sector which is simultaneously underserved by forward-thinking companies and about to explode with Boomers. So excited to be a part of funding for Oneva and support Anita, Bob, and Team! I met Anita while at Kiva and admire her passion and drive for her family and her business. I believe in Oneva. They've earned my trust. I invested in Oneva because I want to be part of a company that is committed to helping people and their families. Calling all UC Alumni Entrepreneurs! - Onēva, Inc.
Oneva is an NMSDC Minority certified Oakland based start-up that has developed a patented, award winning, innovative platform that busy professionals use to view, book and pay for FBI background caregivers (infant to elder care, housecleaning, pet care, massage, etc), all provided as an employer provided benefit. We are in production and collecting revenue with Microsoft. Can a $3 million investment help fix sexism in tech? Not entirely. But some venture capitalists are hoping it will start to reverse the trend. A whopping 117 million Americans are expected to need assistance with caregiving, according The Caregiving Innovation Frontiers by AARP and Parks Associates. It's a $42.9 billion market. Yet, perhaps because women are the primary purchasers of these services, venture capitalists are ignoring this market opportunity. At the very beginning, there were 22 startups. After three days of incredibly fierce competition, we now have a winner. Startups participating in the Startup Battlefield have all been hand-picked to participate in our highly competitive startup competition. Trust is one of the most important aspects of selecting a caregiver and Onēva believes that it has a vetting process that's better than the rest. The San Francisco-based booking platform for elder, child and special needs care, screens its applicants with fingerprinting technology and FBI background checks as well as reference checks and interviews. 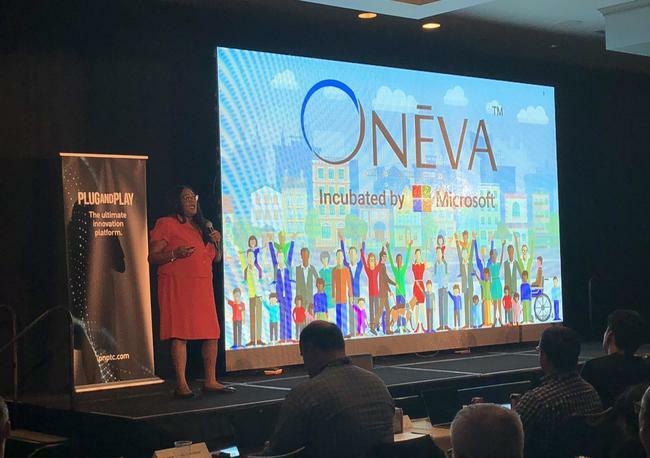 By starting small, but thinking big, Oneva began delivering great care and then determined how to integrate a tech platform to enhance their service. When it comes to finding someone to take care of your kids or your aging parent, the on-demand aspect of services that some businesses offer is not really a selling point. The most important element is trust and the peace of mind that you're hiring a qualified person to take care of some of the most important people in your life. March is Women's History Month! In honor of Women's History Month, the Chamber is contacting women-owned businesses to feature on our blog. Please contact nadine@rcoc.com for details. Funding Opportunities March 10: The Richmond Promise Scholarship March 20: ECIA Community Grant Program Application Due Highlights from the Richmond City Council Meeting - February 28, 2017 E-1. The fastest growing group of entrepreneurs in the U.S. is African-American women. But minority-owned businesses often face greater challenges getting funding. The NewsHour's April Brown profiles two women who have bucked the stereotypes and gotten resourceful to launch their ventures. Americans over 50 represent more than $7 trillion in economic activity yearly: So why do so few tech vendors seem interested in them? The number of businesses owned by African-American women in the Bay Area - and the United States - has been soaring, according to a new government report. In San Jose alone there are a number of such businesses, including the Black & Brown thrift shop, Lillie Mae's House of Soul Food, Strictly Styles Salon, Krazy Komb and others. OAKLAND - When parents leave their children in the care of others, whether it's for work, a "date night" or a sudden emergency, they're looking for "safety first" and peace of mind that the kids are in good hands. Oneva was announced "Best Startup in Silicon Valley 2015" at The Startup Conference, held May 14, 2015 at the Fox Theatre in Redwood City. A panel of leading venture capitalists selected Oneva as the winner of the pitch competition. Oneva provides trusted nannies, sitters and elder companions to families in the San Francisco Bay Area. The tech startup world is notorious for its lack of women and non-Asian minorities, as anyone who has attended the TechCrunch Disrupt pitch-a-thon (or seen Mike Judge's spoof of it) can attest. But it's not like the best concepts are always invented by tech bros. 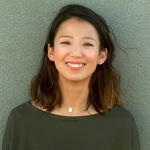 Menu Contents View Advertisers Up Front Valley Women Three alumnae honored for Silicon Valley work Anita Gardyne, BA 86 (Economics), MBA 88 , is on a roll. In May, Oneva, the company she co-founded with her husband, won best startup of Silicon Valley at the 2015 Startup Conference in Redwood City. Like the broader tech world, venture capital firms suffer from an acute lack of diversity - which tends to bolster investment in companies run by founders who look like their investors. Minorities are even more poorly represented, with blacks and Latinos each making up only 2 percent of investors, according to the most recent Venture Census, in 2011. Thanks for vouching for Anita! If you'd like to invest in Anita, please open an account. We'll waive your fees if you do it now. We asked Anita for 10 personal references. Can you vouch for Anita?